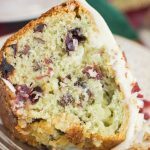 This super moist Pistachio Bread recipe is made with one bowl, no mixer required, and is sooo easy! 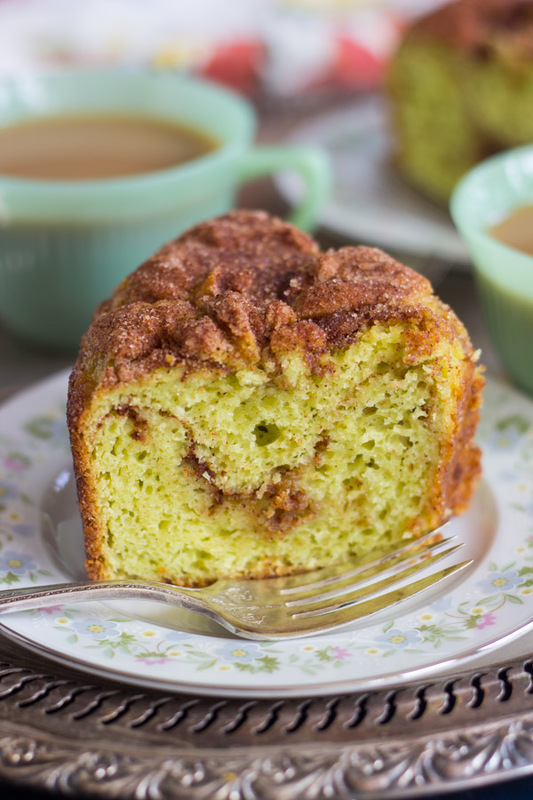 This Pistachio Bread is made with pistachio pudding mix, yellow cake mix, and ribbons of cinnamon-sugar for an ultra delicious bread or coffee cake! A family favorite that my Grandma’s been making for DECADES! I am so disconnected from the world. I am back in Pennsylvania visiting my family this week for the holidays. I’m staying mostly at my Grandma’s house, and she doesn’t have internet. I mean, of course, because there aren’t that many 89-year-olds that really need internet! Totally understandable, but as a result, I am pretty MIA on the blog this week! My apologies. You deserve a break from my chatter anyway, so I’ll spare you any small talk and we’ll get more or less straight to the good stuff…. FOOD. Food with SUGAR in it. Lots of sugar. That’s what we’re all here for. Let’s face it, we’re all swimming in last minute holiday preparations anyway, and you probably have all sorts of fun activities and family stuff going on this week! Since I’m home visiting family, staying at my Grandma’s, and since we often make this Pistachio Bread together for the holidays (though we make it year-round too), it seems fitting to share her Pistachio Bread recipe! I grew up on this stuff. It’s absurdly easy and only requires a handful of ingredients. 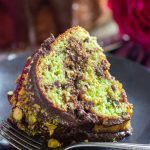 You can mix this Pistachio Bread altogether in one single bowl – no mixer is needed! It’s easy prep and easy clean up! When you’re mixing it, the pistachio pudding kinda makes it look like something out of Ghostbusters, but it definitely bakes up much more pretty. We call it a bread, yes, but it’s pretty cake-like! 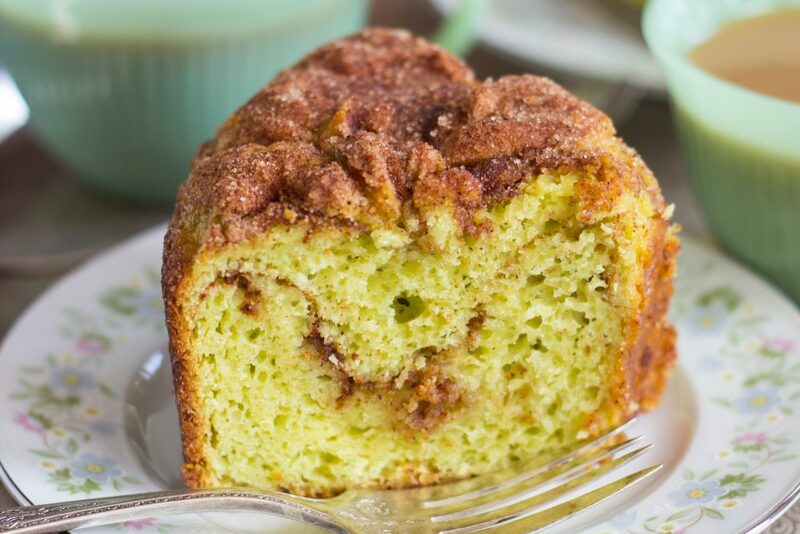 This Pistachio Bread is moist and sweet, and has a thick ribbon of cinnamon and sugar both through the middle and on top. In the middle, it gets deliciously gooey and sticky, and it forms a perfect crustiness on top! 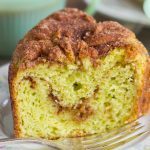 Pistachio Bread is a fabulous snack or dessert, but warm from the oven with a pat of butter, this bread is perfect as a coffee cake for breakfast or brunch too. We love it and it’s been a family favorite for YEARS. No one has to know how simple it is to make. That part stays a secret. K? 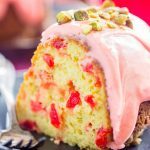 This super moist Pistachio Bread recipe is made with one bowl, no mixer required, and is sooo easy! 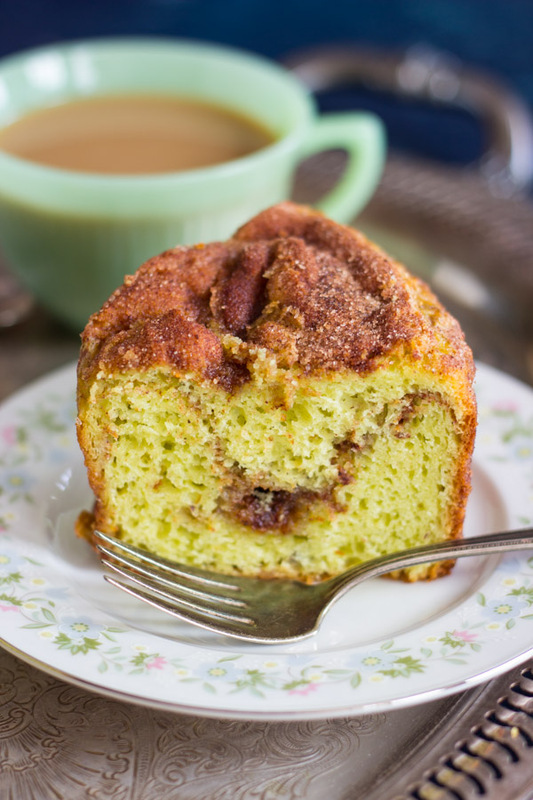 This Pistachio Bread is made with pistachio pudding mix, yellow cake mix, and ribbons of cinnamon-sugar for an ultra delicious bread or coffee cake! A family favorite that my Grandma's been making for DECADES! In a large bowl, stir together cake mix, eggs, sour cream, oil, and pudding mix. Mixture will be thick. Spread half of it into a lightly greased tube pan. Sprinkle with half the cinnamon-sugar mixture. Add remaining batter to tube pan, and knife in remaining cinnamon-sugar. Cool for 10-15 minutes before inverting onto a serving platter. If you love pistachio things, you might want to try these Pistachio Sugar Cookie Bars with Cream Cheese Frosting. They are so well-loved! I also adore this Amaretto Pistachio Cheesecake – the flavor combo is out-of-this-world. 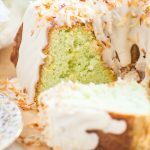 And this Coconut Pistachio Bundt Cake is INSANE. I am OBSESSED with it! I hope you have a great time in Pennsylvania, Sarah! I’m sure it must be strange to not have the internet! I’m loving this pistachio bread. It looks so gorgeous! 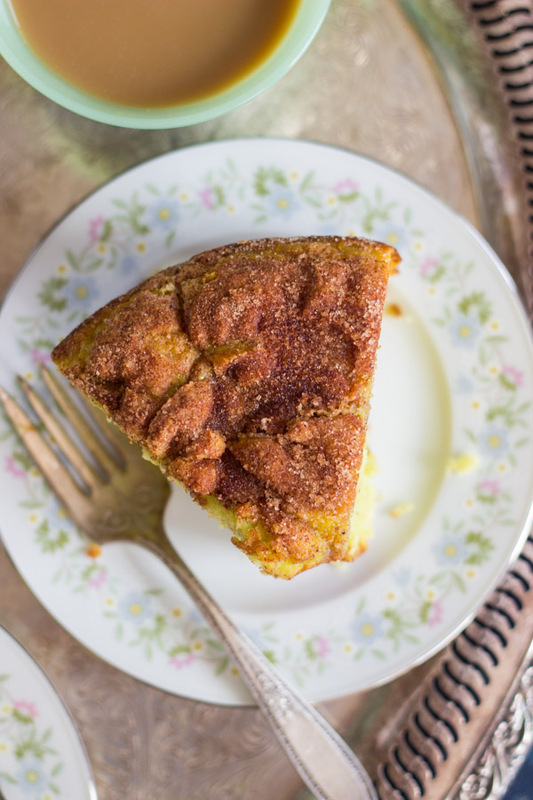 I love the cinnamon sugar topping, too. 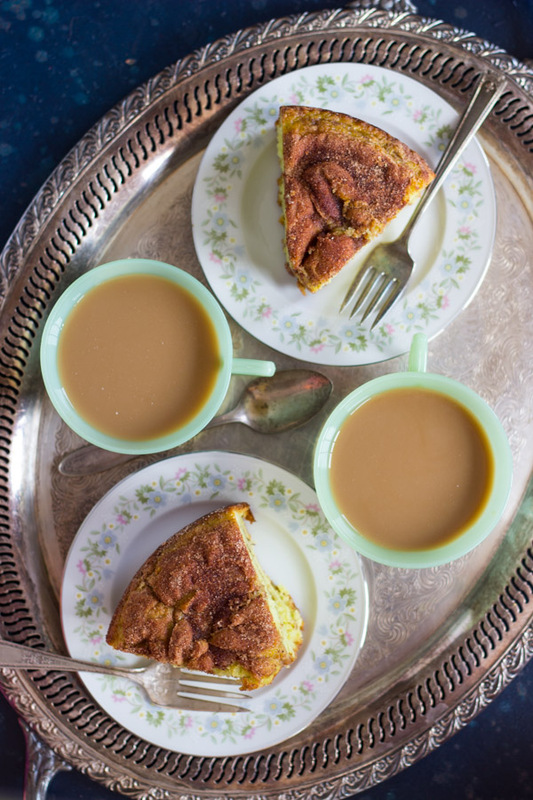 Sounds like this would make the perfect Christmas morning breakfast! 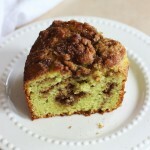 Love grandmas pistachio bread, it looks incredible! Have a wonderful time in PA and Merry Christmas! Thank you! You too!!! Happy Holidays to you and yours! I love how simple this bread is! Have a great Christmas and enjoy your time with family! This sounds delicious. 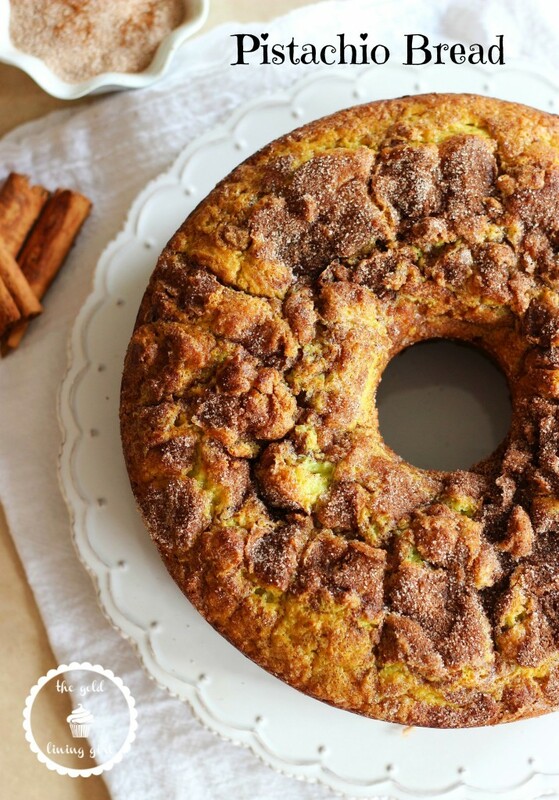 It looks like a coffee cake that’s very easy to make. I will make it! Is there no water or other liquid in this recipe? I don’t want to mess up! Oh, that’s great! I’ve never heard of the variation with frosting, but I’m definitely on board with that!! Frosting is always a good thing! 🙂 Happy New Year! Made this over the holidays; it was delicious and my family loved it! Very easy too! Just my kind of recipe! I love pistascio! This looks amazing! Thanks for linking it up at Monday Funday. This sounds out of this world amazing! Thanks for linking up with What’s Cookin’ Wednesday! These look so delicious! I’m featuring them as on of my favorites over at Wednesday Whatsits. I made this yesterday for Christmas morning. Huge hit! Just the right amount of sweet! Easy to make and just delicious! Thinking for making this for st. Patrick’s day breakfast. Can I make it in a bundt pan? Absolutely! That would work, for sure! It maybe my phone, but I cannot see the recipe portion? Sometimes on mobile, it prompts with a ‘read more’. Do you see where you ‘read more’ and the recipe is always at the bottom of the post! Just scroll down, or do ‘read more’. Thanks, Alexandra! Can I substitute Greek yogurt for the sour scream?